This double crown mirror combines simplicity and sophistication with its frameless design and crowned top and bottom. The rounded, beveled edges create a smooth and sleek finish. A lovely and elegant wall accent for any room in your home. Is this mirror bathroom rated? BEST ANSWER: No - this is not damp nor wet location rated. 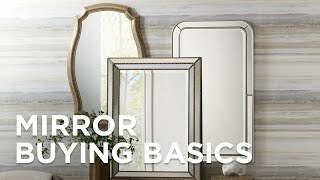 How does the the Double Crown Frameless mirror #P1626 hang? As in, do they have build-on back hooks or some thing? BEST ANSWER: All of our mirrors have hooks bonded to the back. The vendor has included all the hardware and screws needed to hang this beautiful mirror. The frameless design on this contemporary round mirror creates a clean edge and sleek appearance to seamlessly blend into the wall. This rectangular vanity mirror features beveled glass and a sleekchrome finish. The premium metal construction frame of this beveled glass oval wall mirror is finish in alluring satin nickel.